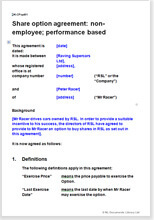 Use this agreement to grant a share option to a third party who is not an employee (or not yet, at least). It is based on his results or achievement. Conditions to trigger the option are to be entered by you. Suitable for any business. He may be associated in any capacity. Example: a third party Internet marketer working for an Internet business or a contracted operator of a hotel or adventure park or leisure facility. This document may be bought and provided by either the company management or the person who will be the optioner. The optioner may be associated in any capacity and in any business. He may be a corporate body. Example: a third party Internet marketer working for an Internet business or a contracted operator of a hotel or adventure park or leisure facility. Conditions to trigger option to be entered by you. The optioner is not an employee. It is assumed that the optioner will achieve some goal or target to qualify. The option is triggered by the performance criteria agreed between the company and the optioner and set down as a schedule to this agreement. We have provided an example deal, but it is for you to enter details of your exact deal that may be any arrangement you like. We have provided for the optioner to pay for the option and also to pay for the shares on exercise of the option. Either or both provisions may be deleted or the sums increased or reduced. You can see these at Share option agreements. This would also be a good time to put into place a new shareholders’ agreement whilst you are in charge of the shares. If you wait until the optioner is a new shareholder, you will have to take greater account of what he wants. Look at Shareholders’ agreements. This document is drawn under basic contract law: no special rules, no tax arrangements, no complications. "I appreciate your patience. I have to say though it took me a while (I had almost given up) to come across your internet site, but I was quite impressed with the manoverabilty of the site itself and the services it offers. Normally I am very cautious about internet services and am pleasantly impressed by you professional response. Without doubt I will definitely be recommending yourselves to others."